Hooray for Strawberry Mousse! Especially when it’s made healthier. I am so glad that spring is here. That means the price of berries becomes more affordable. So I have been making all kinds of treats with strawberries. My most recent strawberry recipe, my strawberry truffles, quickly became one of my most pinned recipes. I am hoping you will enjoy this healthy mousse recipe as well. 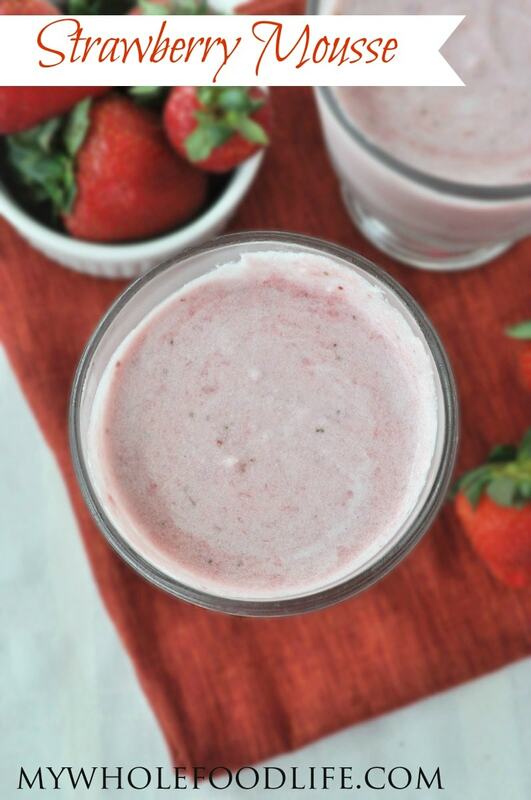 The coconut and strawberry flavors go so well together. I also have a yummy strawberry ice cream and a grain free strawberry tart. It only takes 3 ingredients to make this delicious strawberry mousse that is perfect for spring! This mouse is not only easy to make, it’s also vegan, gluten free and paleo. Enjoy! Here is a short video on how I make the coconut cream. Super easy! For more videos, you can subscribe to my You Tube Channel. Only 3 ingredients to make this delicious dessert! Place the can of coconut milk unopened in the fridge overnight. In a small blender or food processor , combine the strawberries and maple syrup. Open the can of coconut milk and scoop out the solid part. Put it into a mixing bowl. There will be some water left in the can. Don't throw it away. Freeze it in ice cube trays to add flavor to smoothies. Using a whipping attachment, whip the solid coconut into a cream. I did this in my Kitchen Aid mixer. This should take a couple minutes. Gently fold in the strawberry mixture. Spoon the mousse into bowls and store in the fridge to set. About 2 hours. If you use frozen fruit, please let it thaw completely before using in this recipe. You may also need to strain out some of the liquid. Enjoy! Melissa--looks great! My husband bought cans of coconut cream (about 5 oz) cans. So, to whip those I'd still need to refrigerate overnight to get them cold enough to make it work, correct? I think so? I have never used coconut cream to know for sure though. Yes, it has to be very cold! I don't know why it says full fat,tho....I never use full fat & have been doing this forever. Yay! I am so glad you liked it! Holy cow, this is good!!!! Super light and refreshing, I'll be making it a lot this summer. Can't wait to try it with other berries. YUM! I am so thankful that I have found your site. My son has multiple congenital abnormalities and severe food allergies. Your site is AWESOME. I think he can eat almost every recipe with very few modifications. He is allergic to milk, eggs, peanuts, tree nuts and all shell fish. I cannot wait to start whipping some of these up. How long would these last in the fridge ? At least a week I think. I am so glad you are enjoying it! I can not wait to try this recipe! What size can do I use? I used a 15 ounce can. I hope you enjoy the recipe! I am not sure. I never tried, but it might work. I don't normally eat anything in cans. The coconut milk is the only thing I get out of a can. Native Forest coconut milk is BPA free, but the quality is awful. So I use Thai Organic. No carrageenan, but it is in a can. Just tried making this mousse but the coconut en strawberries didn't want to incorporate very well. It's more blended strawberries with small white coconut cream pieces. I just put it in the fridge so hopefully it will taste fine in a few hours. But unfortunately my 'mousse' doesn't look so rich and decadent as the picture above. Scooped the cream out and mixed it though so don't know what went wrong. I'm sorry that happened. :( Sometimes I get a bad can of coconut milk and it doesn't want to whip up. Maybe that happened? Love the idea of freezing the extra coconut for smoothies! What a great idea! I love your pumpkin mousse -- made it for my son's birthday a couple of months ago. I used coconut cream and doubled the other ingredients; it was perfect. Everyone (adults and kids) devoured it. :) I'm going to try this one for my daughter's birthday this weekend, but with blueberries (we've got a white/blue winter theme going). I'm sure it'll be great as well! Thanks for this great idea! It turned out well, but was a little bland. Do you think with more strawberries it would still gel? Perhaps a little lemon juice would work or would that make it separate? I haven't worked with coconut solids before so I'm a little lost. Thanks. Sorry it was a little bland for you. :( Do you think the strawberries may not have been sweet enough? I try to use super sweet berries for mousse like this. You could also try adding a few extra berries. A few more strawberries should not mess up the mousse too much. Thanks Melissa. The strawberries were pretty sweet, but everyone's taste is different. I'll make it again and add more strawberries. Also I'll add fresh strawberries on top as garnish. Hey, so I put the coconut milk in the fridge. I took it out carefully, and opened it up....It didn't get hard. (Haha), anyway, I put it in bowl with a lid, and put it back in the fridge. I'm hoping that I can still use it for this, and I didn't @$%! It up too bad. Every once and a while you get a dud can that will not separate. Sorry that happened to you. :( You can try sticking it in the freezer to see if that helps.